How do I view and update my SQL-RD license information? 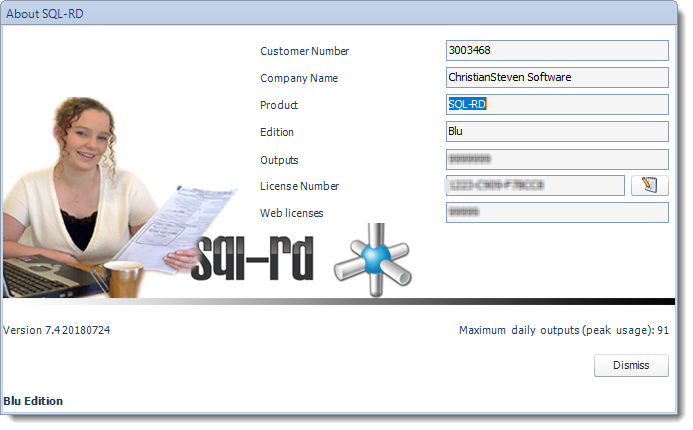 Each year after renewing your Annual Maintenance, you will receive a new license key for SQL-RD. Here is how to update the software with the new key. Please ensure you activate your software with the most recent license key provided to you. Failure to do so may result in issues with the use or functionality and usability of SQL-RD. Each year after renewing your Annual Maintenance, you will receive a new license key for your SQL-RD installation. This license key authenticates to our servers and gives your server "permission" to run SQL-RD for another year. Because our records update each time you receive a new license key, you must update the license key the software uses in order for the application to continue functioning as expected without any interruption to your service. To update the license key to the most recent version, perform the following steps. First and Last Name: Your first and last name goes here. Customer Number: Enter your provided customer number here. License key: Enter your license key here. To enter your license key, click Enter License. The license key field will now be accessible; enter your license key EXACTLY as it appears in your documentation. If the incorrect license key is entered, SQL-RD will fail to update properly.